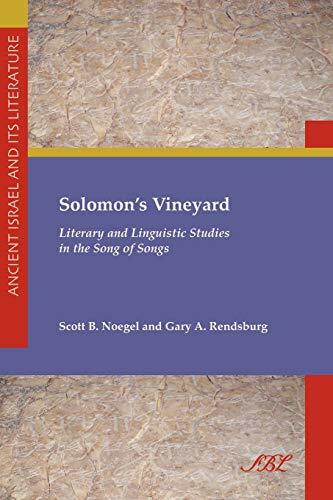 [PDF] Solomon's Vineyard: Literary and Linguistic Studies in the Song of Songs (Society of Biblical Literature. Ancient Israel and Its Liter) | Free eBooks Download - EBOOKEE! Description: There are a number of individuals who have aided our project in a variety of ways, and we take this opportunity to thank them. Several colleagues have read portions or all of the manuscript, and we have benefi ted greatly from their comments. These include James Monroe, Suzanne Pinckney Stetkevych, Yaroslav Stetkevych, Brannon Wheeler, Michael Weiss, and Farhat J. Ziadeh. We also thank David Carr for providing us with the written version of his talk delivered at the joint meeting of the National Association of Professors of Hebrew and the Society of Biblical Literature, in Washington, D.C., on November 20, 2006, and for allowing us to cite his work in the conclusion section of the present monograph. No comments for "[PDF] Solomon's Vineyard: Literary and Linguistic Studies in the Song of Songs (Society of Biblical Literature. Ancient Israel and Its Liter)".